Every year since 1934, hunters hoping to go after waterfowl or other migratory birds have been obligated to buy a Duck Stamp. Once purchased, 98 cents of every dollar spent on the stamp goes to buying wetland and wildlife habitat, which in turn goes back into the National Wildlife Refuge System. The idea is simple: hunters help pay for the land they depend on to hunt in the first place. You should buy a Duck Stamp. Not a hunter you say? Ah, but there are many other reasons to buy a Duck Stamp, even if you have never shot a gun in your life. My 2017-2018 Duck Stamp is gorgeous. Painted by James Hautman, the image depicts three Canada Geese in flight, a golden sunset with waving grasses and pine tree silhouettes in the background. When it’s not in my wallet, I have it pinned up in my cubicle to gaze upon during long afternoons when I don’t have time to take a walk. Duck Stamps are so nice to look at because they are the result of an intense art competition. Open to all artists since 1949, the Federal Migratory Bird Hunting and Conservation Stamp Art Contest chooses the very best avian image to place on a stamp for millions to see. The next winner is chosen in September, and he or she has to paint one of five species in order to qualify: Mallard, Gadwall, Cinnamon Teal, Blue-winged Teal or Harlequin Duck. 2) They act as a pass to National Wildlife Refuges. I like visiting National Wildlife Refuges. 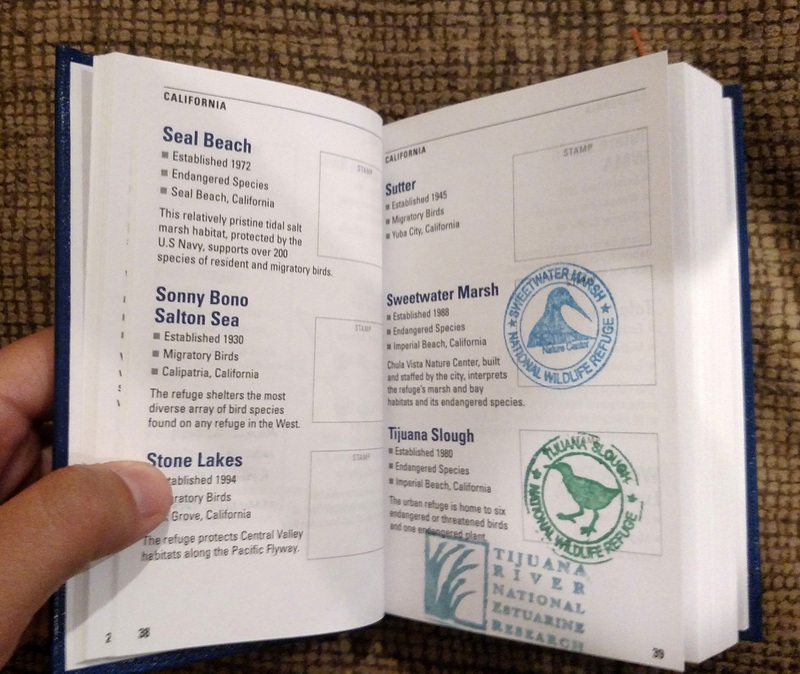 I like visiting refuges so much that I even bought the refuge passport to collect extra ink stamps commemorating my visits (I know, I’m super cool). 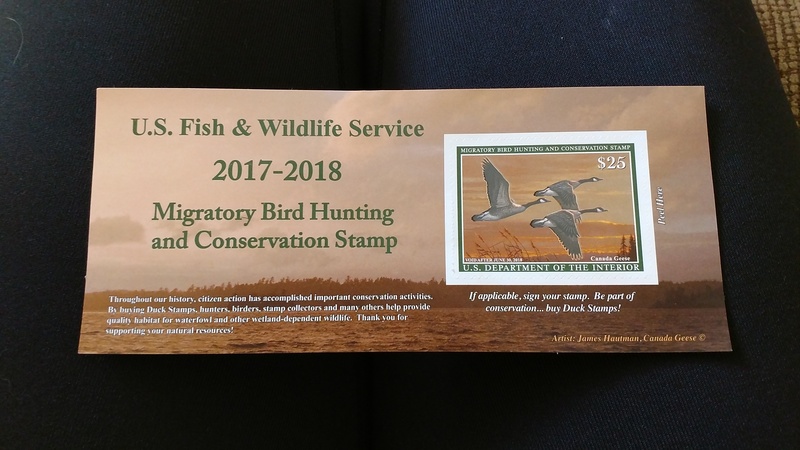 Though it only costs $25, the Duck Stamp acts as an annual season pass to any National Wildlife Refuge that charges an entrance fee. Looking across the year, that will save me money! 3) They protect a lot of land. Seriously, a lot. Since the program was created, over 5.7 million acres have been protected using the money earned from the Duck Stamp. That’s more than 300 refuges – at least one in each of the 50 states. It’s true, I don’t hunt, but I use the refuge system to go birding and swimming and hiking and enjoying the outdoors. Even if I never visit the Ouray National Wildlife Refuge in Utah or the Canaan Valley National Wildlife Refuge in West Virginia (though I hope I do), I appreciate that they are there, protecting critical habitat for a range of species. Have I convinced you? Great! You can buy your very own Duck Stamp online, or at the nearest post office. Happy refuge explorations!